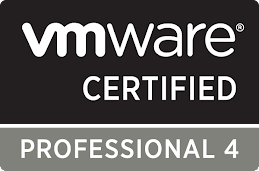 Passed the VCP5 exam today! 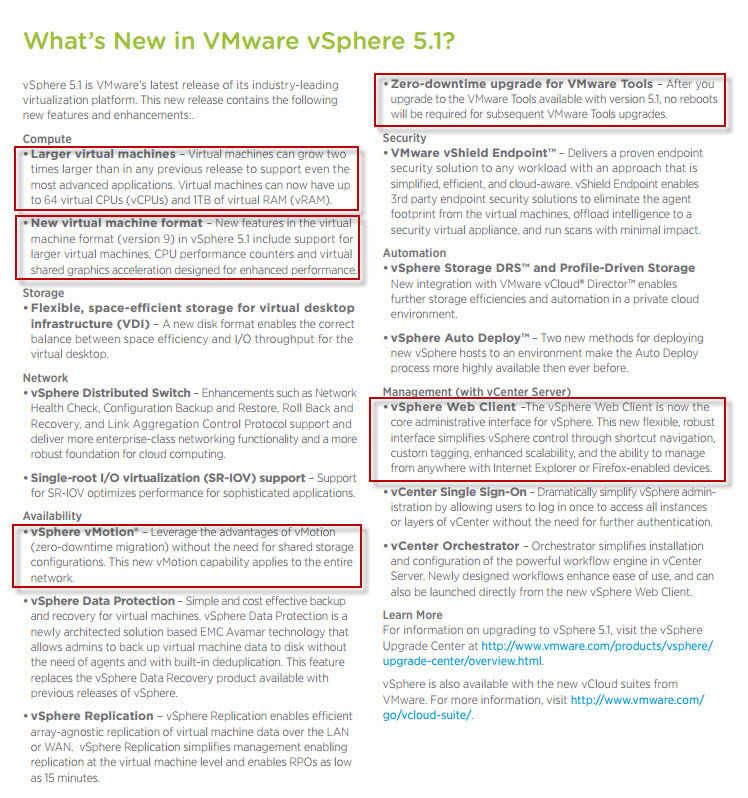 I was going over the "What's new in vSphere 5.1" sheet and wanted to point out the, from an operational standpoint, what is the most important changes. Improved vMotion which lets you vMotion even without having shared storage (vMotion+svMotion). This is described in this post. For customer transition projects, this can probably come in handy. 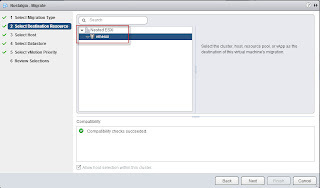 vSphere web client: This is now the default interface for managing vSphere - it will probably take a little getting used to for the server admins. Virtual hardware v9. 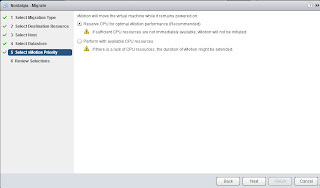 Upgrading will require VM downtime. One can only hope that, in future releases, vHW upgrades can be done in-place. I heard about the new and improved data moving vMotion in the VMworld keynote and wanted to try it out in the home lab. 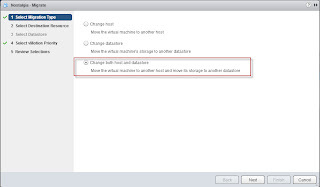 The improvement consists of vSphere being able to perform a simultaneous vMotion+svMotion so you can change both datastore and host at the same time. 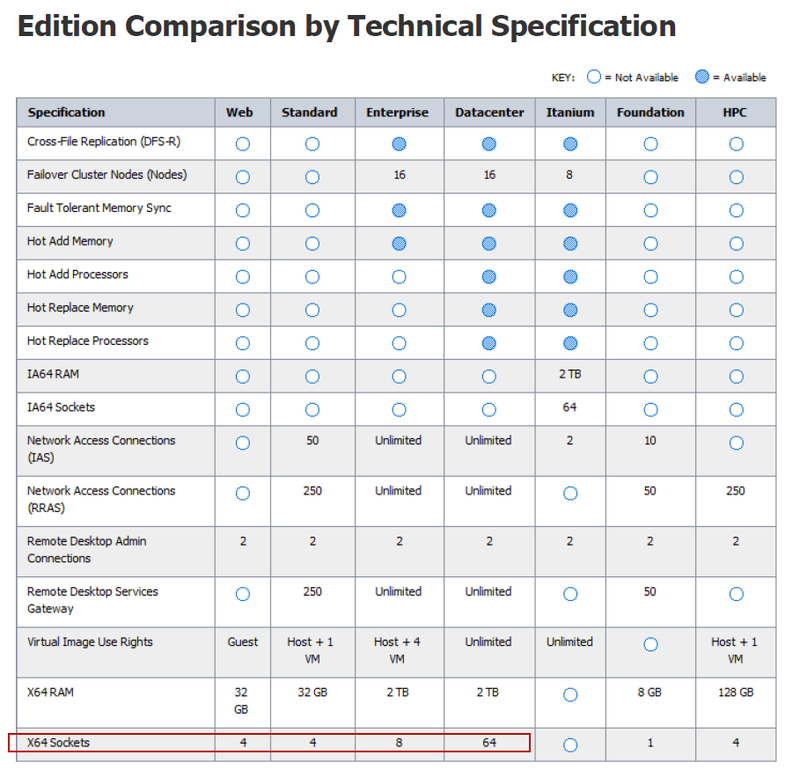 I found an article on yellow-bricks pointing towards the vSphere web client. And for a deep dive, see this post by Frank Denneman. 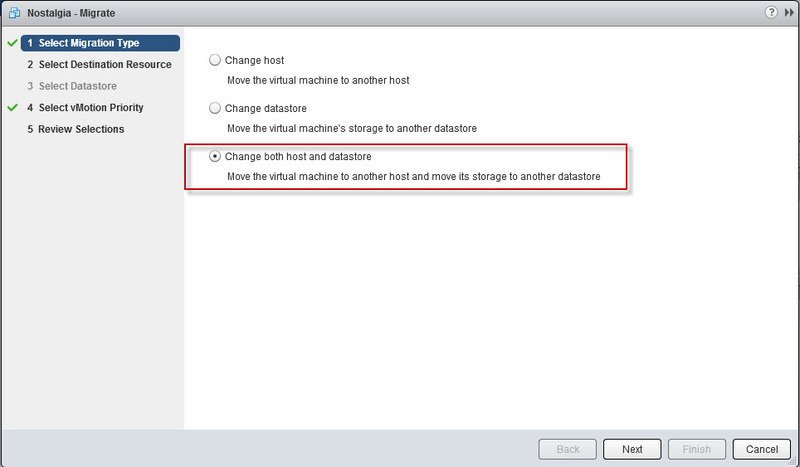 From the vSphere web client the option is available by right-clicking the VM and choosing 'Migrate', see below. 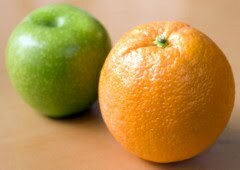 One apparent limitation is that you cannot migrate between Datacenters, only between cluster within a given Datacenter. Other than that, the feature works as expected. I did a vMotion plus datastore move from local storage to shared storage. This is the second feature (here's the first one) I've found that is only available in the vSphere web client and not in the vSphere client which leads one to assume that VMware is actually serious about moving future administration away from the vSphere client. "A general system error occurred: Failed to run Execute operation on esxi-hostname.domain.net: IP address '192.168.1.x' is used for multiple virtual NICs"
I was pretty sure that I had only used that IP address for the service console, or the management interface, for one host. To fix it, it is necessary to modify the profile as it is trying to apply the same IP address to the vmk0 (the management interface) of the other host(s) in the cluster. 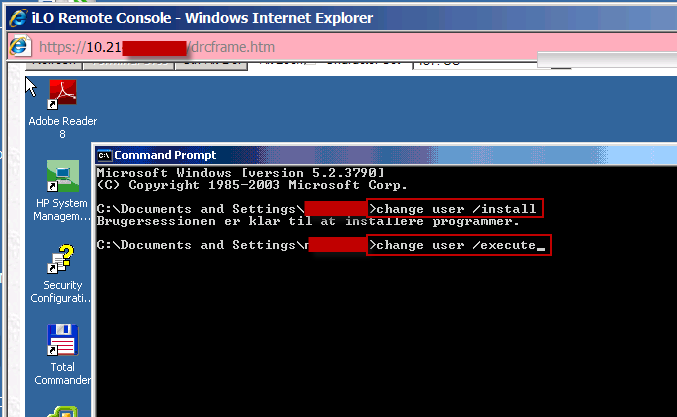 'User specified IPv4 address to be used while applying the configuration', see screenshot below. Then update the answer file for each host and rerun the compliance check. "Longmode is unsupported. It is required for 64-bit guest OS support. On Intel systems, longmode requires VT-x to be enabled in the BIOS. 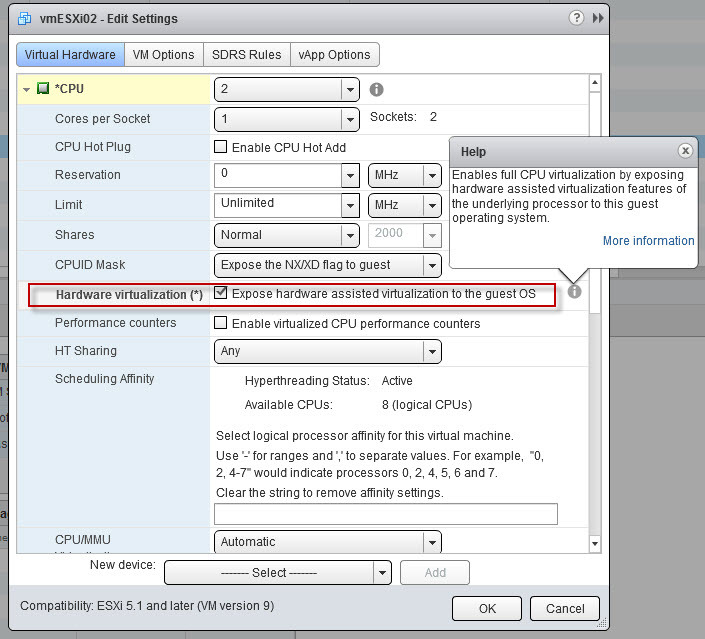 On nested virtual ESX hosts, longmode requires the "Virtualized Hardware Virtualization" flag to be enabled on the outer VM." 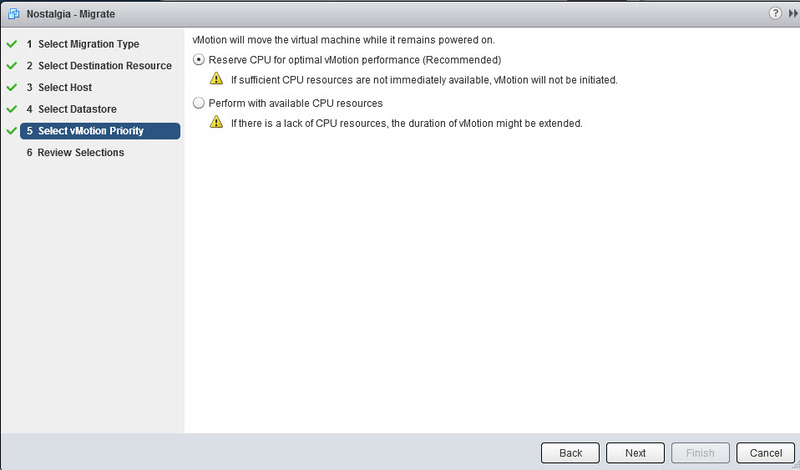 I seem to remember that in version 5.0 you had to configure a given parameter in the ESXi console. 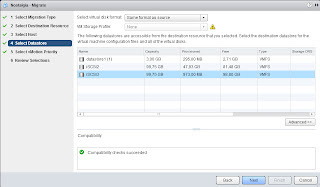 For ESXi 5.1 this has changed according to this VMware KB. "Virtualized HV is fully supported for virtual hardware version 9 VMs on hosts that support Intel VT-x and EPT or AMD-V and RVI. 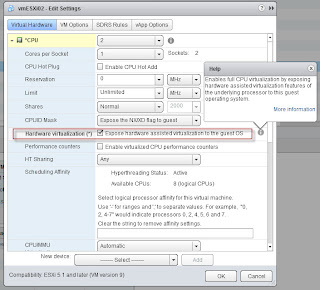 To enable virtualized HV, use the web client and navigate to the processor settings screen. 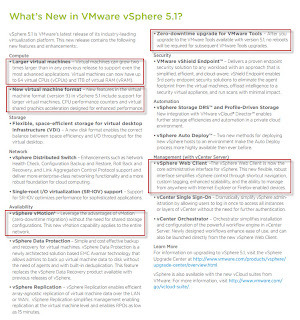 Check the box next to "Expose hardware-assisted virtualization to the guest operating system." 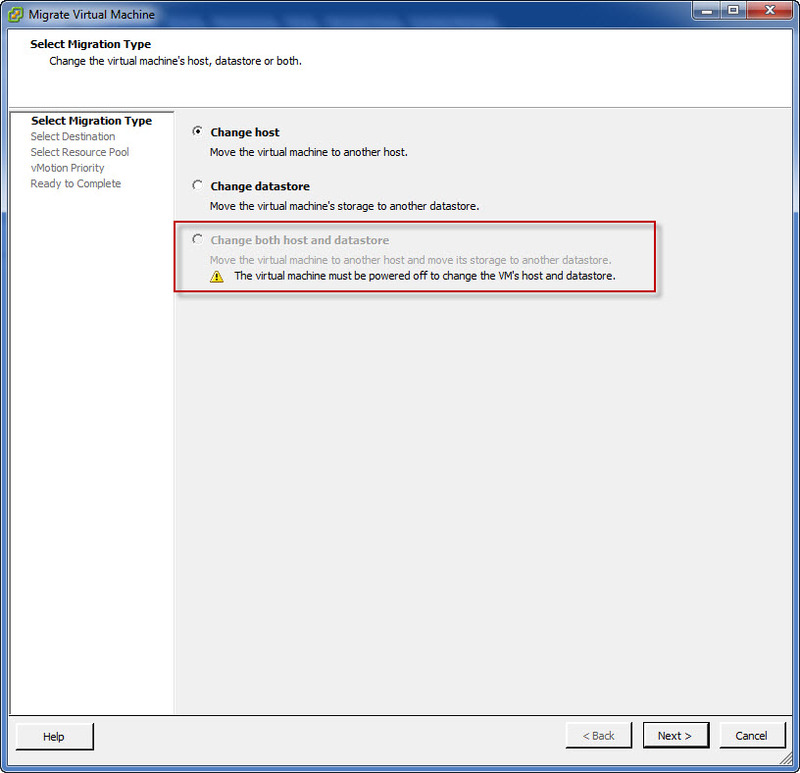 This setting is not available under the traditional C# client." I found a VMware KB indicating that there could be something wrong with the SSL certificate - because I had changed the FQDN of the appliance after initial setup. That seemed a little overkill as the appliance should work or at least you should be able to reconfigure it. For the second time, in my company, we've negotiated a rather large ELA agreement with VMware (ultimately via a reseller) which includes buying a bunch of new licenses and then renewing SnS for the existing ones. With this ELA, there are quite a lot of PSO (Professional Services Organisation) credits that come with the agreement. First time it took us a while to figure out what to use them for, and now the second time it still creates confusion in regards to activating and using them. After entering into the ELA, we received an activation email to an email address that we had specified (we had just told it to the VMware sales guys). Once the credits were activated, we received a confirmation email that they were indeed activated. From here on, it is possible to buy different products and services with the credits. Use the email address that the license activation mail was sent to. If there's no account associated with this email address, then create one. Once logged in, you can add multiple users so that they can log in with their own account and book training courses on their own: Home -> Services -> VMware Training -> myPaymentAccounts -> Edit (or go to My account -> myPaymentAccounts). Here you can also see how many points you have available and what you have used your points for. From the mylearn site it's fairly easy to browse for course training and then paying with the credits. But the credits can also be used for other things such as paying for your VMworld ticket, for consulting services (PSO), and to pay for the VCP exam. 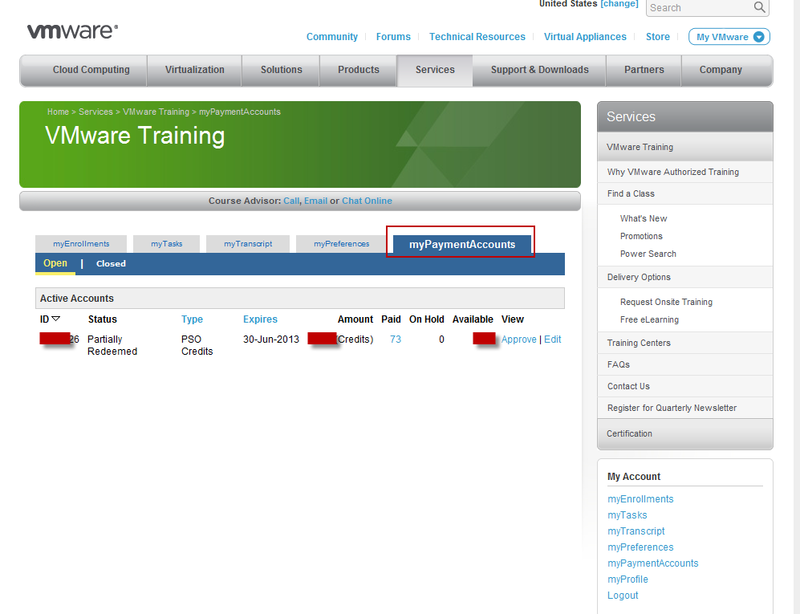 To pay for the VCP exam you need to retrieve a voucher first on the mylearn portal: Home -> Services -> VMware Training -> VMware Consulting and Training Credits -> Continue. Or go directly to this link. Going through this process will generate a voucher code which costs some credits. When you book the exam at Pearson VUE (requires a seperate account) you can use your voucher code to pay for the exam. Yesterday, we had a fairly nasty situation at work where a standalone ESXi 4.1 host had to be rebooted. After reboot it did not automatically reconnect to vCenter and so a manual reconnect was done which prompted for root password. Unfortunately, we did not have the root password (don't ask). The host was joined to a domain but it could not be added to vCenter by using domain credentials and ssh to host with domain credentials did not work either. 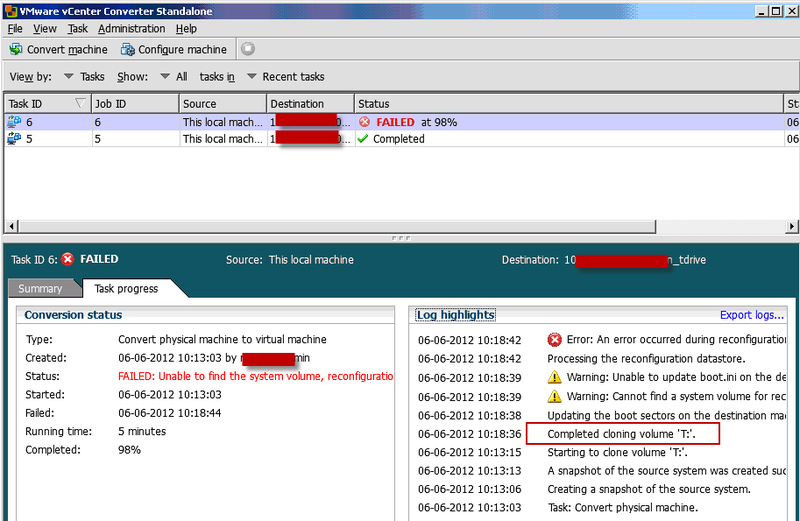 So, having 19 VMs down and no way to power them back on, I was basically screwed (all VMs were residing on DAS). 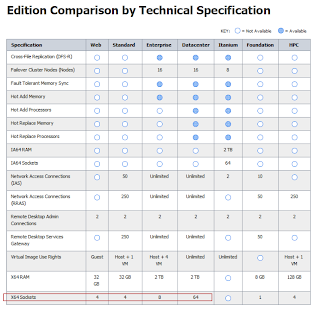 According to this VMware KB article there is no supported way to reset the root password on an ESXi v4 or v5 other than to reinstall it (or do a repair). I contacted VMware support and they sent me a guide for doing it in an unsupported way. This method is similar to what other guides on the web suggests. I went through the process but unfortunately i didn't work. Finally, I mounted the ESXi 4.1 install ISO and did a repair. This resets most host configurations such a root password, network configuration, ntp settings, domain etc. After this I could set the password, reconnect to vCenter and then I had to reconfigure the host. 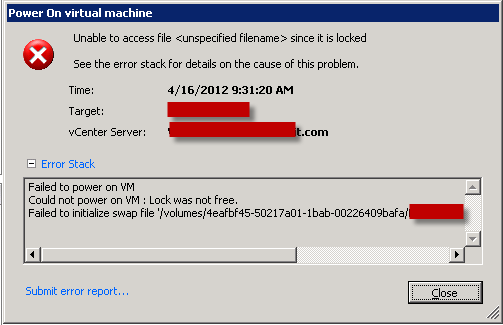 Fortunately, the VMs were not completely gone from vCenter but were presented as greyed out orphaned VMs. So I could still see which LUNs the VMs were residing on. That way, the .vmx files could be located (except for one VM that had been renamed in vCenter without svMotioning or migrating it to another LUN afterwards...), the orphaned VM could be removed and the VM could be readded. It was quite a boring process but a least it worked. Today, I wanted to recreate the password reset method in my home lab to see if I had actually done it in the correct way. 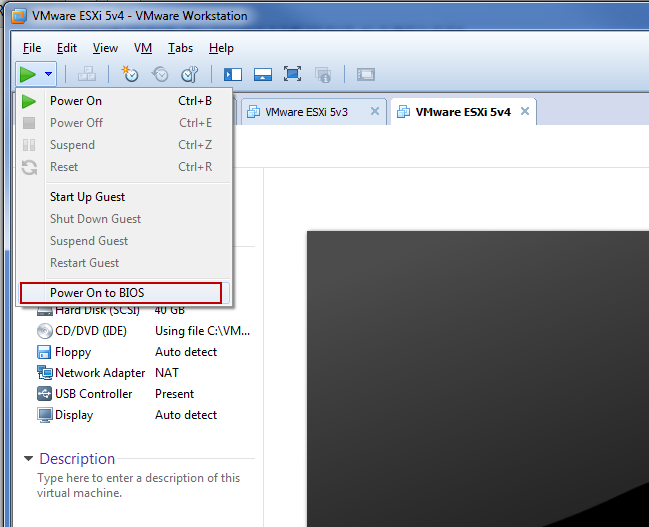 I can confirm that, at least, on a virtual ESXi 5 it works and it is possible to reset the password to blank. Download a Linux live bootable ISO. I used KNOPPIX. Mount the ISO and boot the host. Once booted into KNOPPIX, open a shell. To view HBA firmware version from service console (ESX classic) go to /proc/scsi/qla or lpfc820. For ESXi v5.x, see this link. Snapshots can be your friend but they can most certainly also make your life miserable. The other day we had a rather large VM (with 20 GB mem, 8 vCPUs and 28 TB storage divided on 22 .vmdk's) that crashed during a snapshot commit. 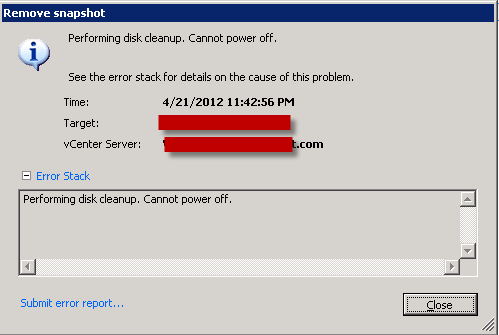 The error stated: "Performing disk cleanup. Cannot power off." 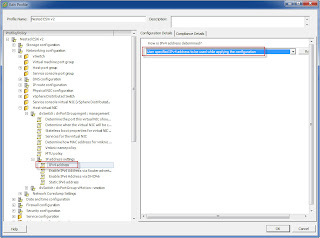 The snapshot had been taken while the VM was powered off and only a few changes had been made to the VM before the snapshot was committed. 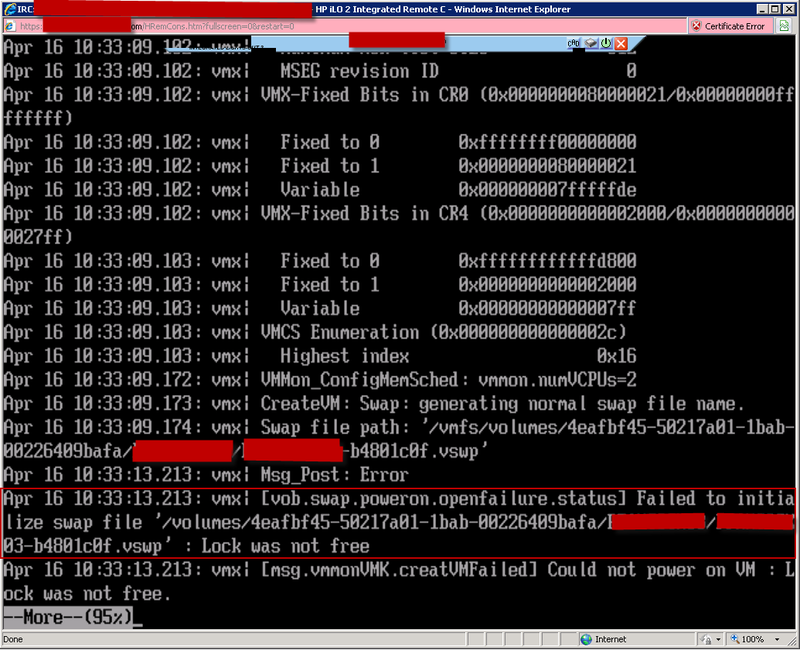 After the crash, the VM would not power on. 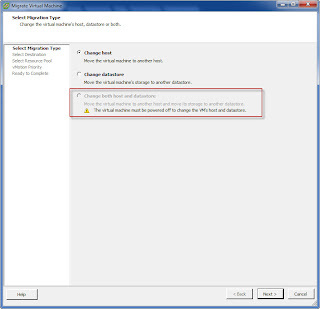 The error stated: "Reason: Cannot allocate memory" and in the error description (see screendump below) there's an indication of disk a lock or disk error. 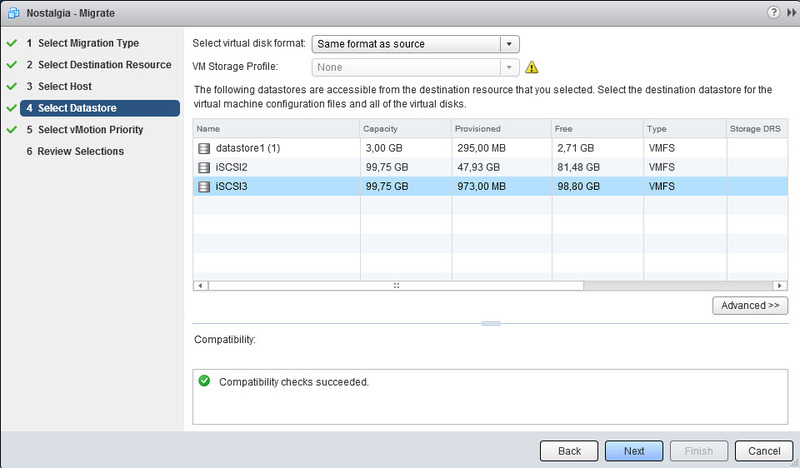 Fortunately, the VM could be started from the service console (ESX 4.1 classic) with 'vmware-cmd'. 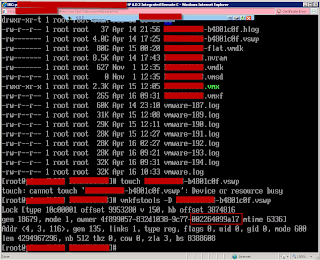 After boot, vCenter stated that there was no snapshots on the VM. However, 22 delta files on a single LUN was telling otherwise. A normal procedure to do cleanup is to power off VM and clone it. However, with 28 TB storage in the VM, this was not an option. 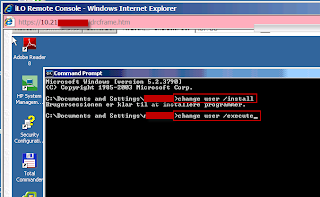 Instead, the following did the trick: Log on to the service console, change directory to the folder where the .vmx file for the VM resides, take a new snapshot and then do a remove all snapshots (see this KB article for more info). This removes the new snapshot as well as the 'defect' snapshot. As you can see in screen dump below at first I tried to run the command without the two boolean arguments that relates to QuiesceFilesystem and IncludeMemory. In the screendump above the removesnapshots command returns an error code '1' which means that all is well and snapshots are gone. The other day we experienced an incident on the SAN storage with high latency and even loss of connection to the SAN. 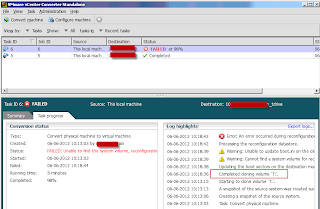 This can generate a lot of really unpleasant errors on the ESX hosts. Even after the SAN is brought back to a stable state we've seen hosts that won't boot, VM's that won't vMotion and VMs that won't power on due to file locks. 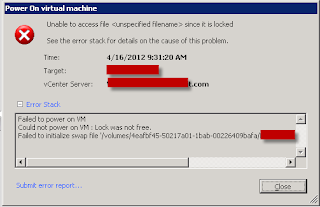 If you receive a 'locked file error' (like screendump below) and your VM won't boot there are a couple of ways to go about it. This VMware KB article explains it quite well. 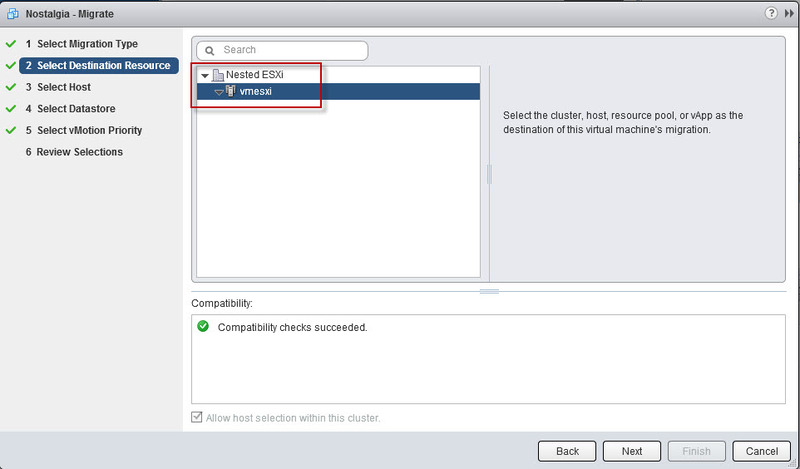 Either you can cold migrate the VM to the other hosts in the cluster (to find the ESX host with the lock) and then try to boot it from there or you can try to locate specifically which host has the lock. 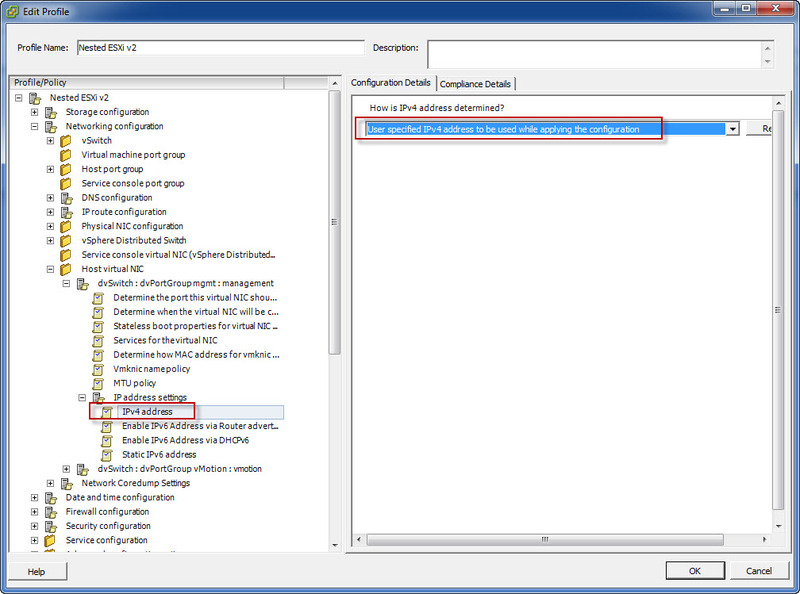 If the vCenter log does not tell you specifically which files are locked, this can be viewed in the vmware.log which is located in the VM folder. 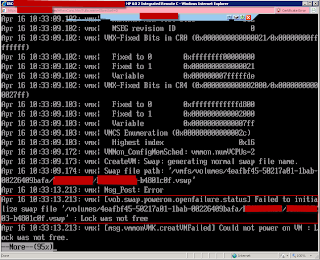 If you just tried to power on the VM, then relevant info should be at the end of the log file. In the example below, it is the swap that is still locked. This can be verified by running the touch command on the locked file. In the screendump below, the MAC address has been highlighted. Once you have the MAC address you can find a match by, for example, logging in to vCenter or onto the Blade enclosure. 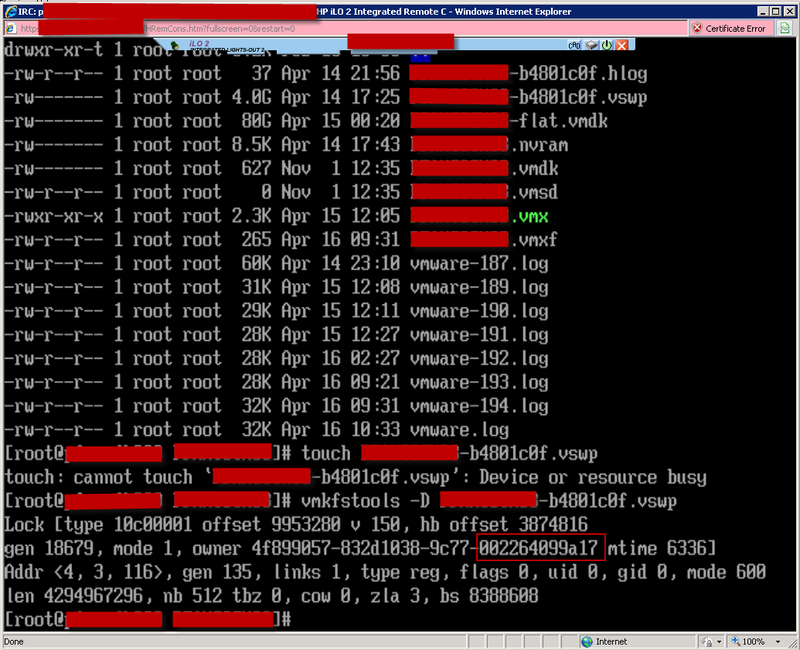 When you have a match, cold migrate the VM to the relavant ESX host and boot it. In Workstation 8, there's a nice new little feature that let's you boot directly into BIOS from the power on button. Instead of having this option under edit settings it has been moved to the power on button itself. A small thing perhaps, but quite practical.